Weight and body image have, unfortunately, long since gone hand-in-hand. I’ve struggled with keeping fit with regular exercise while trying not to binge on all the foods I really want to eat. But, life is short and I don’t want to spend it agonizing over calories or a scale. Blogger, Sara Puhto, feels the same pains. 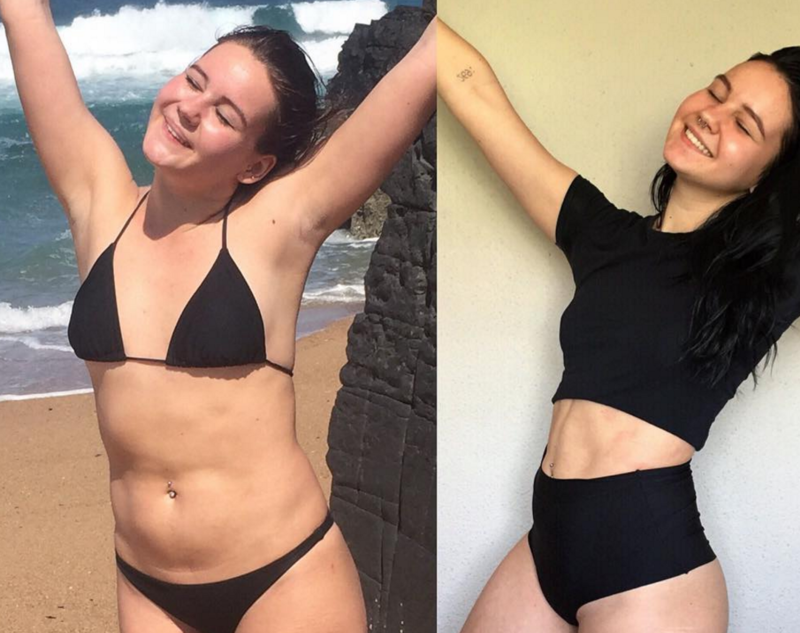 She recently took to Instagram with a side-by-side photo, detailing her quest for better health and we’ve (collectively) totally been there. She writes, "Let's talk food  Left: October 2015 (11 weeks into BBG. weighing 54kg) Right: September 2016. (59 weeks into BBG. weighing 56-57kg). Ever since I started gaining fat, I thought it didn't matter what I ate as long as it was less than 1000 calories." The before image captures a beautiful woman who felt tired and deprived at a weight of 119 pounds. She ate less to weigh less — something a lot of us have done to achieve a specific number on the scale. However, this kind of thinking can have dire consequences — and Puhto experienced these consequences. Not only does this diet tactic backfire (sometimes even adding weight), but it can leave you feeling pretty tired and icky instead of healthy. Of course, everyone’s experience with dieting and relationship with food is different, and there are all kinds of ways to monitor your weight in a healthy way — but in this blogger’s scenario, “healthy” didn’t seem to be the case. In the after picture, she’s obviously glowing, albeit at a slightly higher weight (because of healthy muscle) of 123-125 pounds. She added, "I was so devastated — I didn't understand why eating less wasn't working. I thought I wasn't strong because I couldn't go a few days without binging." It seems simple enough, though, eating less doesn’t often equate to being healthier, per se. She goes on to talk about the moment she decided she’d had enough of the cycle. "I then started eating more and stopped using apps to count calories. It was hard but I knew if I just trusted my body it would work. Something had to work." After going vegan and adding calories to her diet, Puhto started seeing the results she hadn’t before and attributes it to eating the “right” calories, which is important to fuel the body. "I'm not sure on exact weight because I don't weigh myself anymore, I don't let numbers dictate how I feel about myself anymore. I just go on how I feel mentally, and I feel amazing! I finally feel like I have a healthy relationship with food." To live a life without fear of the scale and a better relationship with food? Major props to you, Sara! You’re fab at any weight! And just to be clear — we are *not* saying skinnier = not healthy. Every body is different and beautiful, and there is NO one, right way to qualify what “healthy” means. That’s a discussion for you and your doctor. However, if you’re drastically cutting calories and it’s making your body feel bad? Perhaps you should explore other dietary options! This is ONE blogger’s experience, so if you’re in the same boat, we recommend seeing a nutritionist or your primary care doctor (aka, someone qualified to give you advice on your diet and wellbeing).